If you thought zombies were something to be scared of then it may be time to think again; this good-looking online slot from Amaya Gaming transports us to a world where the undead live normal lives like everyone else – with just the occasional bit of hungry flesh-eating to keep their hand in. It’s called The Zombies and you can read more about it below. The Zombies plays out over five reels and fifty paylines and these particular creatures live button-down lives in clapboard houses where the gardens are delineated by white picket fences. 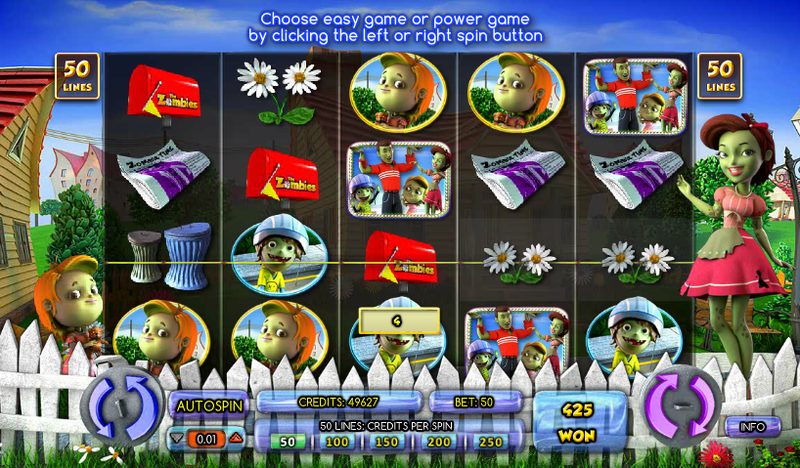 This slot has an unusual feature in that you can choose to play from left to right or right to left. Left to right is called the ‘Power Game’ and you will win larger amount less often. Symbols applicable here are dead flowers, upturned trash, a torn newspaper, an open mailbox and the father zombie. Right to left is called the ‘Easy Game’ with smaller but more regular wins and here the symbols are living flowers, neat dustbins, a pristine newspaper, a closed mailbox and the mother zombie. The zombie boy and girl symbols are the same in both directions, as are the bad zombies. The bonus symbol contains the whole family dancing. To select your preferred style of play, just use the blue (Power Game) or pink (Easy Game) spin buttons to the left and right of the game information at the bottom of the screen. Those dance party scatter symbols are the key to this feature and you will need to land three or more of them anywhere on the reels to start things off. You will receive ten spins initially but each time you land three more during this feature you will get another two spins added to the total. 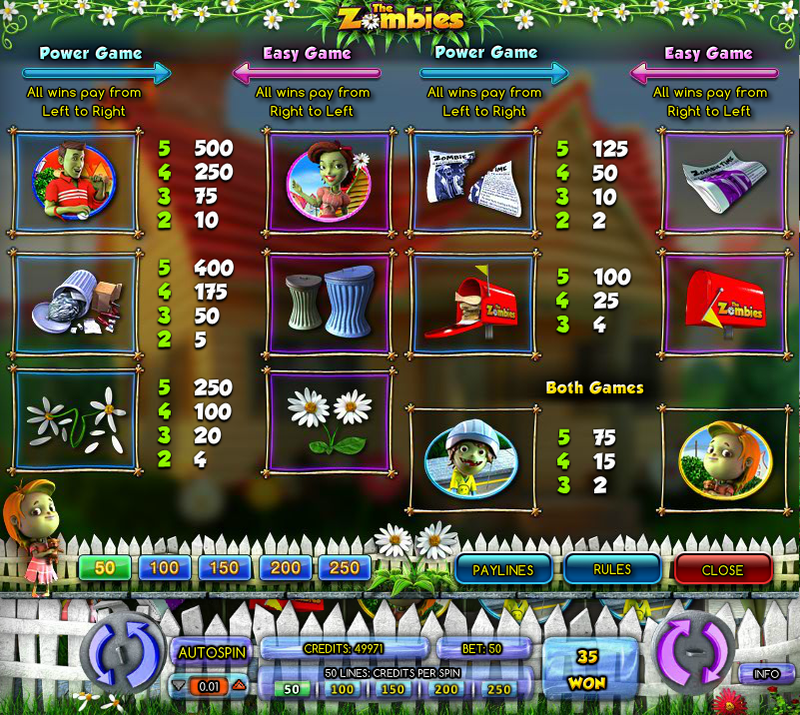 During the free spins you are also trying to land combinations of parents and bad zombies; if you are playing the Easy Game you need the bad zombie to be directly to the left of the mother. If you’re playing the Power Game you need it directly to the right of the father. For each combination you land, the multiplier for the round will increase by 1x. Many of Amaya’s games can seem dated as they have acquired the back catalogues of a number of smaller companies but this is a high quality release with some nice twists and some cool bonus features. There’s nothing to complain about here so give it a go.